Squirrels can be some of the most troublesome rodents found in human-populated areas, and despite their small stature, they’re capable of causing serious damage. Almost any homeowner has some kind of story about a squirrel pillaging a birdfeeder or creating mischief of some sort on his or her property. 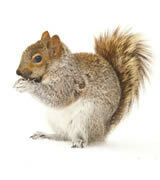 Critter Control in Dallas has years of experience dealing with squirrel damage. Beware the damage squirrels can cause, and address any squirrel-related issues quickly. Squirrels can absolutely upend a carefully tended vegetable patch or manicured garden. Unlike rabbits, they generally can’t be deterred from a property by fences since they’re such skillful climbers. Squirrels have been known to crawl along pipes and wires completely upside-down as if they were furry little secret agents! Keeping them out of a yard or garden can be extremely difficult. Squirrels can cause huge problems for farms and orchards, too. They’ll steal nuts and fruit from trees prematurely or before they can be harvested, and they’ll destroy apples, grapes, corn, cherry blossoms, and melons. Ground-dwelling squirrels can also annihilate fields when they build burrows and search for food. These furry creatures will sometimes invade homes in search of warmth or to build nests. They’ve been known to infiltrate attics and crawlspaces and may even end up crawling through walls and ripping open insulation and air ducts. Their size, agility, and climbing skills also afford them access to hard-to-reach parts of a home, making trapping and nest removal remarkably difficult for homeowners and property managers. Critter Control in Dallas has years of experience with every type of invasive or troublesome wildlife, and squirrels are no exception. It’s important to recognize the signs of squirrel damage and address them quickly before they lead to bigger issues. If you think you may have a problem with squirrels or want to set up service, Contact Us or give us a call today.